Words cannot do The Room justice, but I will do my best to describe what it is. A cult classic akin to terrible movies like Troll 2 and Samurai Cop, The Room has been described by many as “the Citizen Kane of bad movies.” That is perhaps an apt comparison since writer/director/lead actor Tommy Wiseau claims to have drawn inspiration from Orson Welles (and Tennessee Williams, among others). There are no noticeable traits that Wiseau borrowed from any of his alleged idols — this movie is something that can only come from the depths of Wiseau’s bizzare little mind. 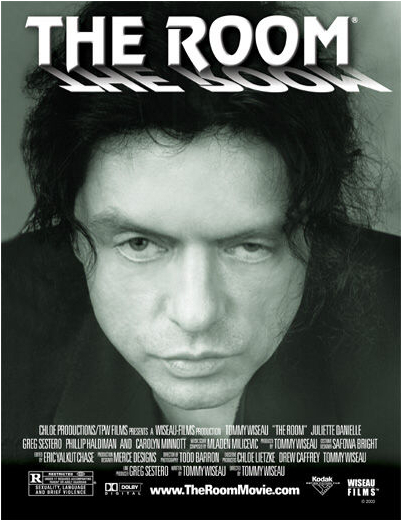 Somehow filmed on a $6 million budget, The Room is a terribly acted, poorly shot, and just plain bad “black comedy.” The actors have little actual talent, and their delivery is usually way off. The movie uses obvious stock footage of San Francisco in between actual scenes. There are countless plot holes, and normally groundbreaking revelations are casually dismissed. There is one scene involving a mother telling her daughter that she has breast cancer, but this is never brought up again. The Room is all over the place, but that’s what makes it so great. – Plastic spoons are thrown at the screen every time one is shown in the movie. For some reason, there are framed pictures of silverware in the background of many scenes. People would yell “SPOON!” then throw their plastic utensils. Sitting in the front row, I got pelted with spoons A LOT. – There are a number of scenes in the movie where characters randomly throw footballs to each other, despite standing just a few feet apart. There were a few groups of people at the theater who brought their own footballs to toss around as well. – My personal favorite, the chanting of “BEST FRIENDS!” every time Johnny and Mark were hanging out together. As stated before, words cannot do The Room justice. This is a movie made to be seen with a group of friends, preferably with plenty of booze. The Room is unlike anything I have ever seen, and seeing it in a theater was unbelievably entertaining. I cannot possibly rate this movie on a proper scale of 1-10, but for entertainment value it is as good as it gets. Also saw this a midnight showing at a sold out theater, also found it to be the funniest moviegoing experience of my life. Could not control myself whenever the crowd started yelling “GO! GO! GO! GO! GO!” during the slow pans across the Golden Gate Bridge. Too freakin’ much. Haha, isn’t it great? Tommy Wiseau is going to be here in Chicago next month for a midnight screening, too. I definitely can’t pass up the opportunity to meet the man, the myth and the legend in person.